Egyptian's rip-roaring goal sees Liverpool past Chelsea and back to the top of the Premier League. Liverpool's title hopes were dealt a decisive blow by Chelsea at Anfield five years ago, but after this encounter, the Reds have good reason to dream. Mohamed Salah's remarkable goal, just two minutes after Sadio Mane had headed Liverpool in front, completed a sucker-punch from which an otherwise impressive Chelsea could not recover. The pre-match narrative, centring around those dramatic events in 2014, almost willed Liverpool to stumble, but Jurgen Klopp's grin after Andrew Robertson inconsequentially lost his footing proved his side were anything but preoccupied with banishing those demons. Nevertheless, their first home victory against Chelsea since 2012 may well prove a critical one. Mohamed Salah has been dismissed by his critics as a 'one-season wonder' after failing to replicate his dizzying numbers from last term, but it's fair to say he silenced them with his long-range thunderbolt. 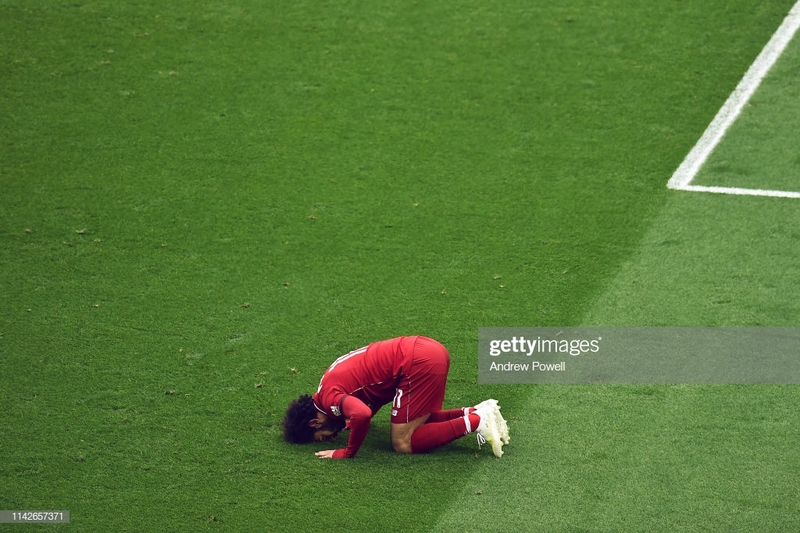 Salah's lack of tangible contributions in big games has also seen him slighted but, after a moment of individual brilliance gave Liverpool the lead at Southampton, he produced arguably his best goal for the club against his former employers. When one considers the disturbing footage of racist chanting levelled at the forward which emerged this week, his exploits are all the more admirable. Salah has, admittedly, endured difficult spells this season - his goal against Southampton was his first in nine matches - but on the whole he has managed to effectively shoulder the immense pressure which come with footballing superstardom. His celebration - a symbol of inner peace - is a testament to his impeccable attitude. He now finds himself back level with Sergio Aguero at the top of the goalscoring charts. Chelsea were resilient in defence for 50 minutes, but it was clear that they were reliant on Eden Hazard if they were to take three points from Anfield. Hazard, indeed, looked in the mood against an opponent he has tormented in the past. Time and again he glided through challengers in trademark fashion, with his team-mates feeding him at every opportunity. But when he had genuine chances to make the difference, he fluffed his lines. First, he hit the post when trying to slot past Alisson from close range, then he failed to get clean contact on Willian's cross and the goalkeeper was able to make a fairly simple stop. They were, certainly for a player of his ability, sitters. Both came shortly after Liverpool threatened a blitz. Had he scored one, Chelsea would surely have thrived in a nervy Anfield. This game was a tale of two star players: one swept up in ecstasy amid the other's self-inflicted agony. After Liverpool's quickfire double, with Anfield manic, the home side continued to pile forward and threatened a rout. But strangely, this seemed to play into Chelsea's hands as the game opened up, and they were able to cut through Liverpool on more than one occasion. Perhaps the Jurgen Klopp teams of old would have gone for the jugular, but this side recognised that the pattern of the game had become was unsustainable and slowed the tempo. At one point, Naby Keita even stopped in possession and visibly gestured to his team-mates to calm down. Helped by substitutes Georginio Wijnaldum and James Milner, Liverpool took the game under control and reestablished their dominance. Soon enough, a third for the Reds looked more likely than Chelsea pulling one back. They were able to see the game out and bank their 18th clean sheet of the season. It truly was a champion's effort in the second half. Jordan Henderson has been moved into a more advanced role by Klopp, and whilst the switch has allowed him to showcase a different range of abilities, it cannot alone explain the sharp upturn in form which begun at St Mary's. Henderson, more than anybody else in red, is brimming with hunger and desire at this crucial stage and has the air of a man who knows the next month or so could define his career. His contribution this time peaked with a perfect cross for Mane to attack and convert. A standing ovation from every corner of the ground on his withdrawal was merited. Henderson is truly leading these potential history-makers by example. Liverpool must keep their feet on the ground, even after a glorious return to top spot. After all, they remain reliant on a sensational Manchester City side to drop points if they are to come out on top in this monumental title race. City strolled through a tricky-looking fixture against Crystal Palace earlier in the day, their feathers barely ruffled even after Luka Milivojevic gave the hosts hope. But now come their biggest tests - a clash with Spurs at the Etihad followed swiftly by a visit to Old Trafford to face top-four chasing rivals Manchester United. At their best, they will likely pass both, but any dip could well be punished. Liverpool must continue to focus on themselves - their trip to Cardiff on Sunday - after their return from Champions League duty in Portugal - could well prove gruelling. Still, Salah's heroics in this fixture, the battling victory over Southampton and the late, late drama against Spurs all had the distinct feel of championship moments.